Venezia, Venezia! O Sole mio… One of the most beautiful and attractive cities in the world undoubtedly is Venice. How many stories are written there inspiring very known writers such as Shakespeare or Mark Twain. Carnival of Venice, Marco Polo or “gondola”: all these words remind us immediately the fascinating Venice! One typical venetian souvenir is the Murano Glass. Glassmaking in Murano (Murano is actually a serie of Islands next to Venice) has been originated during the 8th century. As Venice was a major trading port, we can notice that the glass has foreign influences, either Asian or Muslim. Murano’s reputation as a center for glassmaking was born when the Venetian Repubblic ordered glassmakers to move their foundries to Murano in 1291, because they feared fire and the destruction of the city, mostly composed of wooden buildings. Murano’s glassmakers held the monopoly of quality glassmaking for centuries, developing or refining many techniques. But beginning from the 17th century, Murano’s prominence as a glassmaking center began to decline slowly, causing almost the vanishing of the craft! It was due to political changes and the consequence was that the glassmakers went away from Venice and new glassmaking techniques were developed elsewhere. Fortunately, the 19th century saw a “renaissance” of Murano glassmaking, thanks to businessman Salviati (he sold glass tiles to refurbish the mosaics in Venice) amongst others. Then, during the 20th century, mainly tourism helped to revitalize the industry. 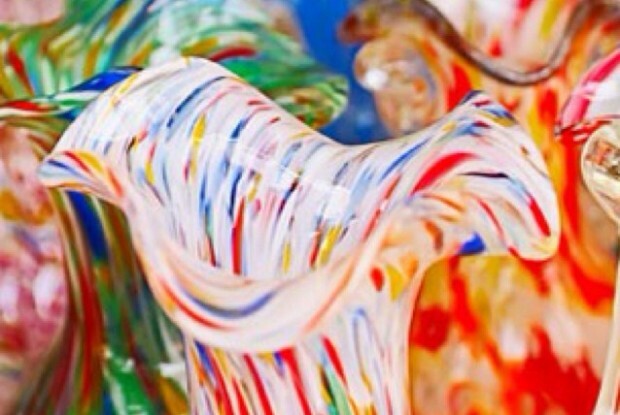 But, by the way, how is Murano glass created? It is a complex process: extremely high temperatures convert silica to a molten liquid state and is cooling slowly (this is the Lampworking technique). They add flux, a sort of melting agent, to help the glass to slow the solidification process. It is during the cooling process that the artisan can work on and shape the glass! To produce beautiful effects, they also add raw materials, such as sodium (for an opaque glass surface), nitrate and arsenic (to eliminat bubbles) and so on. Not forgetting coloring and texturing materials. Today, the artisans of Murano are still using these centuries-old techniques, crafting many objects such as chandelier, figures, vases etc. They took also advantage of the shining and the colorfulness of Murano glass to make jewels that became one of the most common souvenirs of Venice. There is also the Murano Museum of Glass to visit if you are passionated by this unique technique.